Editor’s note: From a sports watch to a dress watch. 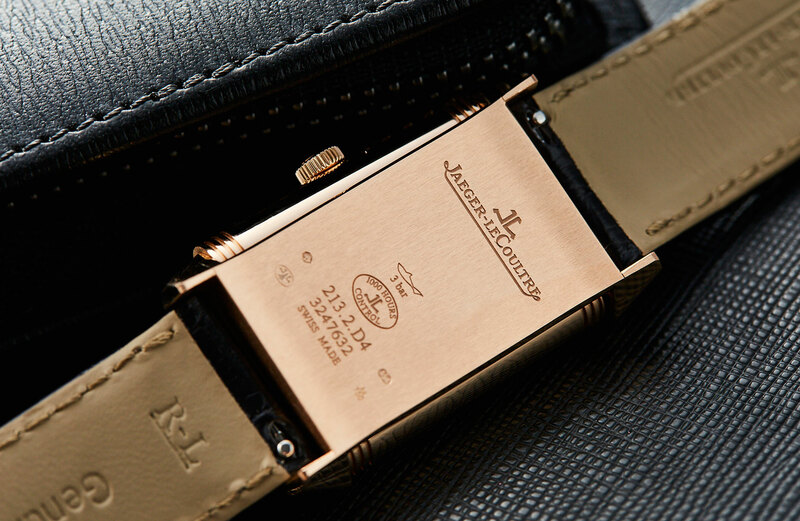 The evolution of the Jaeger-LeCoultre Reverso has seen it transform like night and day. 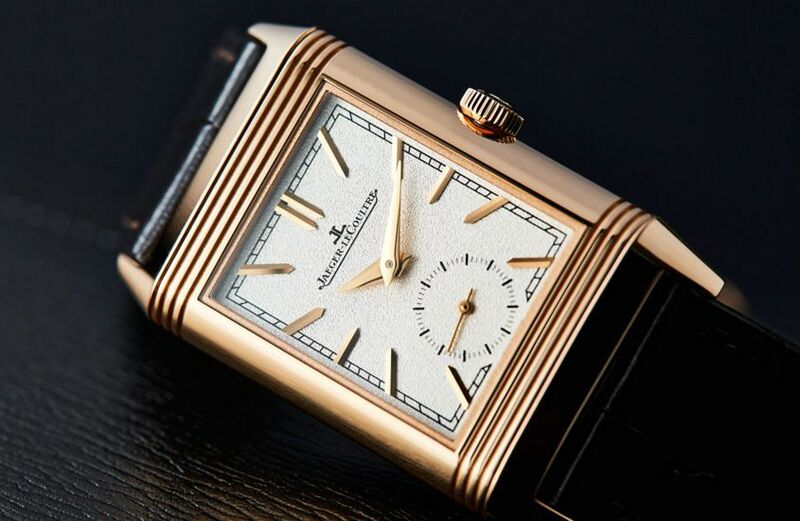 And the icon that is now more associated with suits and ties, rather than mallets and sticks, is made even grander here in a pink gold case and duelling dials of wondrous textures. 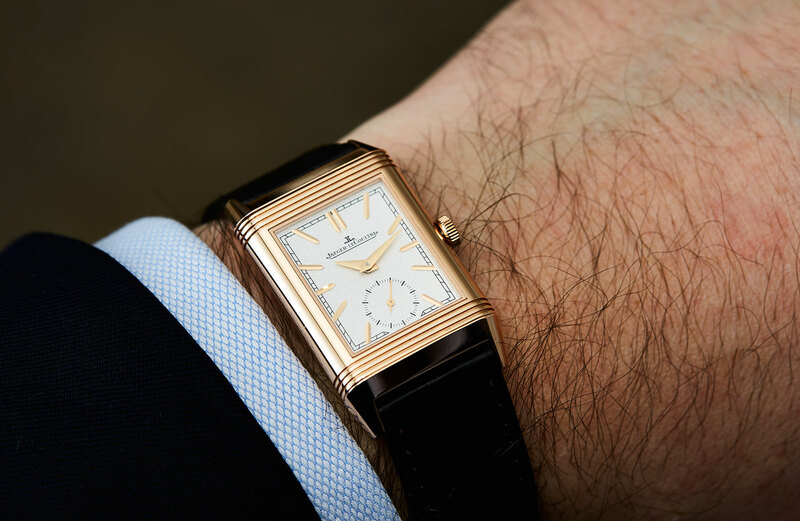 Believe it or not, the Jaeger-LeCoultre Reverso is one of the original sports watches. The oft-quoted origin story about this iconic rectangle is that it was the dusty polo fields of colonial India that gave birth to the reversible watch, which could be easily flipped to protect the delicate dial during the rough and tumble of the chukka. 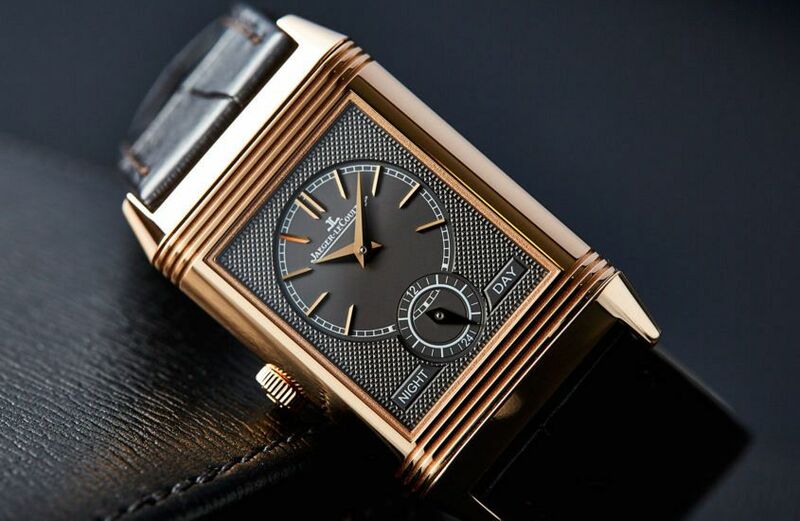 That was way back in 1931, and in the subsequent decades the perceptions of the Reverso have, much like its ingenious case, done a complete about-face. 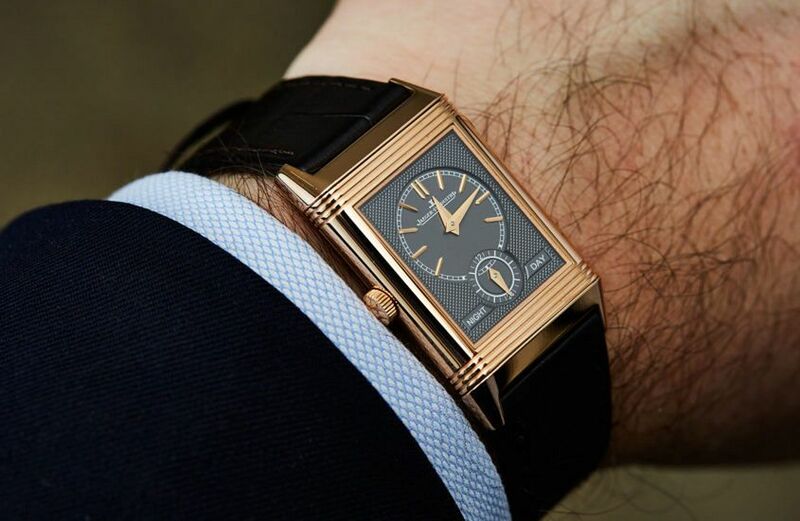 In 2017 the Reverso stands out as one of the default black-tie watches. 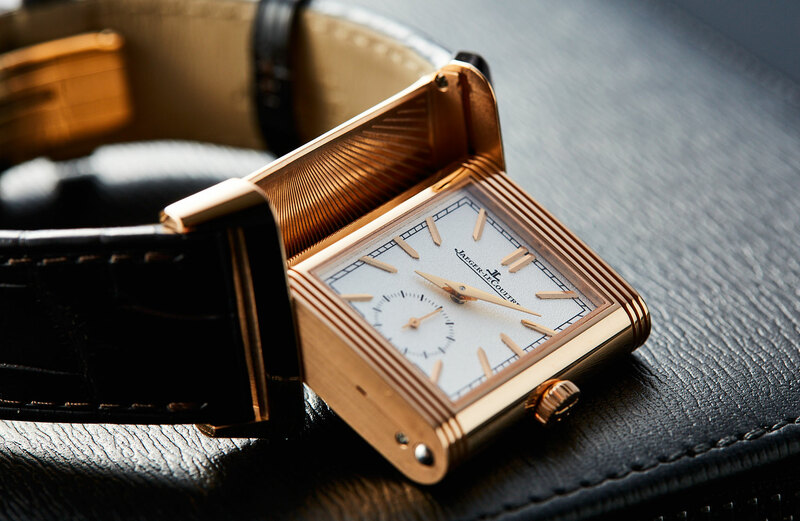 Nowhere is that more apparent than with this Tribute Duoface, which looks absolutely stunning in pink gold. The case size is reasonable – but by no means overwhelming – at 25.5mm wide by 42.9mm high. The one thing that shines brighter than the gold on this watch is the clever and varied use of texture. Everywhere you look there’s a different finish. The front dial is described by JLC as a slate grey, but I’d be much more inclined to refer to it as a silver, with a rich eggshell texture. Whatever you call it, it looks good. The second dial is just as stunning, a velvety clous de Paris guilloché, that displays a second time zone, thanks to the clever manually wound calibre 854A/2. The dial textures are highlighted by the polished applied numerals and simple dauphine hands, and, in the case of the second dial, the matte finish of the inset dials. The texture doesn’t end there, though: there’s a pleasing juxtaposition on the case itself. The non-polished sections, primarily in the architectural details of the main case body, are left seemingly raw, giving them a frosted finish. 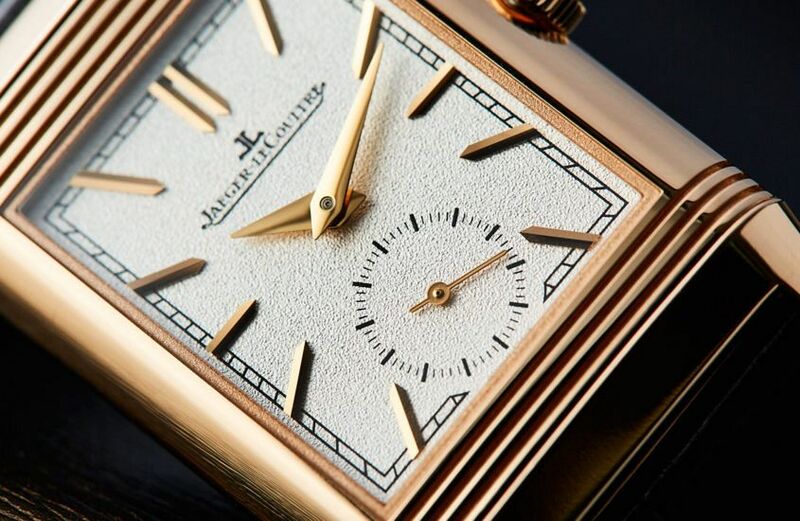 Then there’s the sunray engraving on the inside of the outer case, a detail you only see for a few seconds at a time, which makes the fact that JLC included it even more special. The caseback is brushed, and fairly text-heavy, though there’s still room there for a personal inscription. 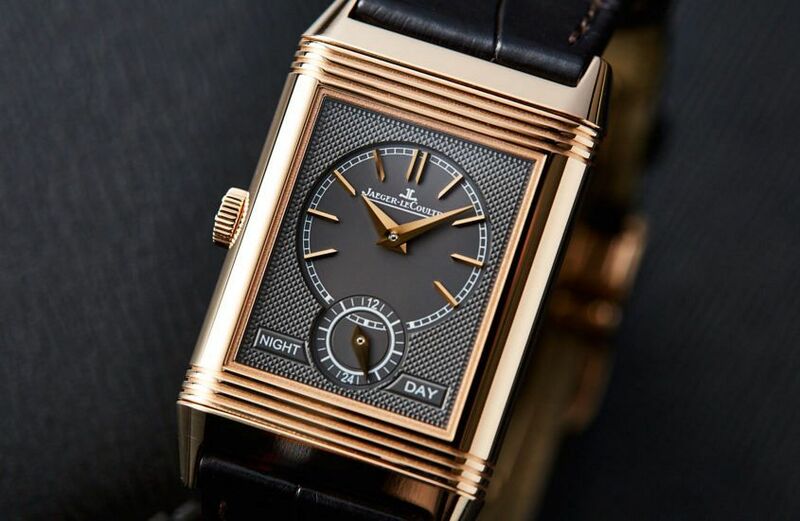 While the purpose of this fine timepiece is a far cry from the rough-and-tumble Reversos of yore, there’s no mistaking the clarity of line and shape that is a defining characteristic of the Reverso, and the combination of heritage style and precious metal in this Tribute Duoface makes for a potent combination.